(Photo: Reuters / Las Vegas Sun / Steve Marcus)Gun law reform bills are now headed to the Senate floor after approval by the Senate Judiciary Committee. The U.S. Senate Judiciary Committee on Thursday passed a bill that would ban assault weapons, prohibit large capacity magazines, and implement universal background checks on gun sales. The bill was part of a gun law package supported by President Barack Obama. The bill was approved in a 10 to 8 vote, with no Republican support. Californian Democrat Sen. Dianne Feinstein, the bill's sponsor, said the bill would ban 157 types of firearms. "It exempts 2,271 weapons," Feinstein said. "Isn't that enough for the people in the United States? Do they need a bazooka?" A week ago, the panel cleared a bill intended to crack down on gun trafficking. Buyers of firearms who sell the guns to people restricted from owning one can face jail time, even if they didn't know of the ultimate buyer's status. The Obama administration, state leaders and faith leaders around the nation have strongly advocated for tougher gun legislation following the Newtown mass shooting that left 20 children and 6 adults dead. The shooter, 20-year-old Adam Lanza, used an assault weapon owned by his mother to carry out the massacre at Sandy Hook Elementary. Supporters of gun law reform argue that measures such as the ban on military-style weapons or restriction on the size of the amminition clips would deter or limit the intensity of such atrocities. 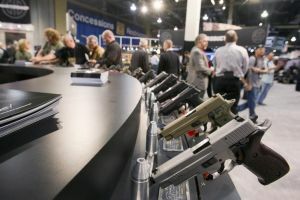 Critics of the legislation, including the National Rifle Association, say the new gun laws don't help deter crimes and would impede on law-abiding citizens' Second Amendment right to bear arms. The gun reform bills now head to the Senate floor where they will face different fates. The bill approved by the Senate panel Thursday faces the toughest fight with no Republican backing. Christians will be discussing the role of congregations in advocating for tougher gun laws during the Gun Violence Prevention Sabbath Weekend, which kicks off Friday and ends Sunday.